Vintage Audis have two reputations: they are absolute monsters to drive in the winter and they are impossible to find nowadays in running, working condition for reasonable money. Well, friends, take a look at this $750 of frail German steel. 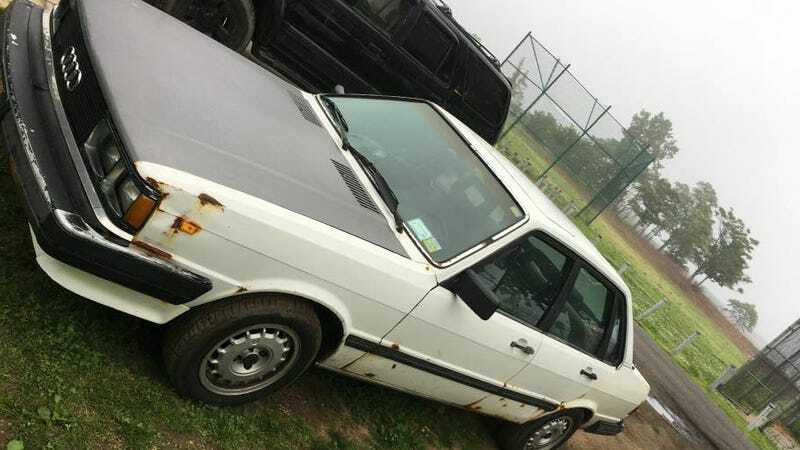 This is a 1983 Audi 4000S located right here in New York City for not even a grand. And it runs and drives. And it has a five-speed manual. To be fair, the reputation for these old Audis is that they parts that make the car go are rarely ever the problem. It’s all the other things that go that drive you insane. Electric windows fail, switches break, plastic trim crumbles, all of that. But, having driven one of these things, diffs locked, upshifting into second mid-powerslide and holding it, still sliding, across snow and ice, I’m convinced these things are worth the $5,000 to $10,000 people usually want for one. Starts right up every time! I’m sure it’s fine. Don’t mind the rust on the frame. Frames....uh......you don’t need those. You’re good. Look for the car here, and please buy it so I don’t and oversteer foot to the floor into a tree in Maine. 1) In the United States, all 4000 quattros were equipped with the 2.2L 5-Cylinder engine, while the non-quattro cars had a 4-Cylinder. Interesting sidetone, the FWD 4000s was available with the 5-Cylinder in Canada, not sure why the USA didn’t get that option. The exception were the rare “5+5” models, which had the 5-Cylinder and a 5-Speed, but as far as I know, that was exclusively an option on the two-door model. 2) The early quattro cars had power front windows (later ones had all power windows). 3) No quattro control panel in front of the shifter. These early cars would have had the push-pull knob to lock the centre and rear differentials. The later cars had a rotary knob to do the same. This panel was at the base of the centre stack, just in front of the shifter/ashtray. If you’re truly an Audi dork like I am, you can also call out the wheel style (that style of wheel was only available in the 4x100 bolt patter of the FWD cars, not the 4x108 pattern of the quattro-equipped cars), and the fact that the floor-pan is a slightly different shape (the quattro cars have a bigger transmission/driveline tunnel, which also means the seats are not interchangeable between the FWD and quattro cars). So, no four-wheel-drive hooning in this thing, unfortunately. Thanks Adam! We were so close, and yet so far, to the cheapest little four-wheel powerslides around.